Superb raw denim with our biggest stretch factor yet. It's the Japan Big Stretch. 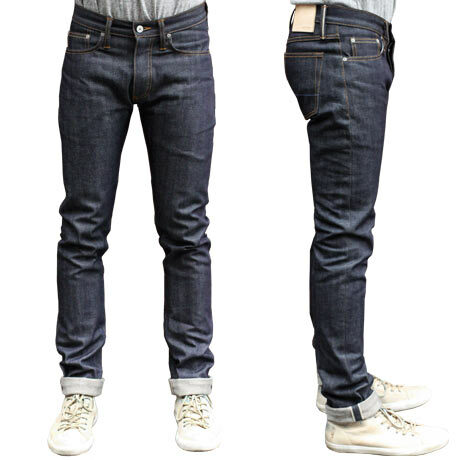 It's no secret that we've become huge fans of raw stretch selvedge denim. The combination of raw denim looks and fades with the huge boost to comfort that even a touch of stretch adds is phenomenal. This version dials it up a bit and things get even better. The base is a true classic. A metallic blue indigo warp and crisp white weft. A slightly looser weave allows the weft to show through more and brighten up the surface. A bit of starch lets you know this is raw denim and the 11 ounce weight sets the stage for comfort. Now comes the highest stretch factor we've run to date. Movement is incredible. You would never expect this denim to ease given how raw it looks but it responds to every move. It's a pleasant little surprise that you enjoy every time you walk or sit down. Trust us, it never gets old to be in classic raw selvedge that's instantly wearable. This is definitely the best of both worlds on a warm day and a denim experience you don't want to miss. *Note unlike most brands we don't use vanity sizing for our pants. If you're a first time customer we highly recommend checking out our fit guide. Fit Available in our Straight, Slim and Skinny fits. We’re very serious about our fits here at Gustin. The best pair of jeans in the world will be worthless to you if it doesn’t fit like a glove. They’re the result of years of wearing. We often wear new fits for months ourselves before releasing them to make sure they pass the real test of everyday living. Most importantly, once we define a fit we love, we do not change it. We may run it in different fabrics, but you can be confident that the fit will be the same one you love each time. This is our modern slim cut. We’ve dropped the rise as compared to the straight fit so it sits lower on the hips. The thigh has been brought in along with the knee and there is a slight taper to the cuff. Definitely a more fitted look, but very wearable. This is the perfect, classic straight leg fit. Not too skinny, not too loose. The rise is just right, but not super low. It’s a timeless cut that will never go out of style. Gustin was born with this fit and we’ve been wearing it for over 2 years daily. This is our skinny cut. It's a true skinny fit - for people who are looking for a more aggressive cut. The thigh is significantly narrower than our slim fit, and the cut carries down to a narrow cuff opening. Picking the right size is very important. We know from selling thousands of pairs of our jeans that the best way to decide which size to order is to measure your best fitting pair of jeans, and compare with our size guide. All of our measurements are pre-wear and pre-wash. Expect our waist to stretch as they break in (raw denim stretches more as it breaks in than washed fabric), and shrink minimally when the pants are washed. You have a pair of jeans labeled size 30 that fit perfectly. You measure the waist of the pants like in the image to the left and find that actually measure 33" in the waist. Why are they a size 30, why is the waist measuring 33"? It's because many brands use "Vanity Sizing" to make you feel better about your waist size. We use it less than most. So you have the 33" measurement. Now, let's select your Gustin size. Raw denim will ease about an inch in the waist as it breaks in. The stretching of the waist band typically takes a couple weeks of good wear and only achievable if you are able to button the jeans all the way up. 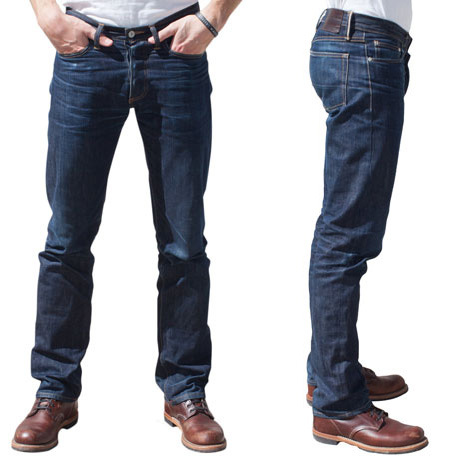 We recommend choosing the Gustin size that is closest to .5" under your measured pair of jeans. In this case, you would choose Gustin size 32. Your Gustin jeans will come measuring around 32.5" and will be snug the first time you put them on. 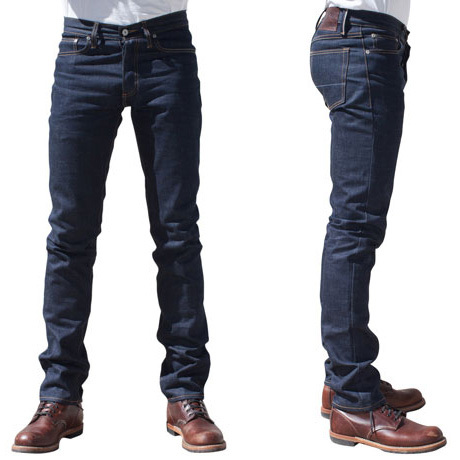 After a few weeks, the waist will relax and you will have a pair of jeans you can wear with or without a belt. This is where personal preference comes in, if you are looking for a comfortable fit right out of the bag without the break in process, you might opt for the 33.